8:20am A verbal warning for manner of driving was issued to a motorist in Walnut & Mansfield St. area. 9:44am Officers arrested a 36yr old Bucyrus man for breaking and entering in the 700 block of Ridge Ave. The matter is under investigation. 10:11am Officers investigated a report of vandalism in the 500 block of Failor Ave.
11:17am A false alarm was received from Kroger. 12:13am A false alarm was received from Kroger. 1:37pm Officers assisted a man in the 100 block of S. Spring St. having medical problems. 2:53pm A wallet found in the 100 block of Fisher St. was turned in to the Police Department. The owner was contacted and picked up the wallet. 3:32pm A false alarm at Kroger’s was investigated. 3:58pm A report of a young child outside alone was investigated. 4:13pm Officers attempted to serve a city income tax summons in the 600 block of S. Walnut St.
4:38pm A disturbance in the 1800 block of E. Mansfield St. was investigated. 4:57pm Officers conducted a welfare check at Bucyrus Plaza. 5:04pm David Duzan, 59, was arrested for aggravated menacing, and inducing panic. He was taken to the Crawford County Justice Center to be held for a court appearance. 5:35pm A parking issue in the 100 block of W. Oakwood Ave. was investigated. 5:43pm A report of a disorderly juvenile in the 600 block of S. Walnut St. was investigated. 6:30pm A resident in the 1100 block of Monnett St. reported his garage broken into. 7:06pm A report of a burglary in the 400 block of W. Mansfield St. is under investigation. 7:30pm Officers assisted a motorist locked out of their vehicle at IB Tech. 7:56pm A dispute between neighbors in the 600 block of Kaler Ave. is under investigation. 8:29pm Officers assisted the staff at Bucyrus Community Hospital with a disorderly female. 9:58pm Officers conducted a welfare check in the 1500 block of N. Sandusky Ave.
10:18pm A report of a burglary in the 400 block of W. Mansfield St. is under investigation. 10:40pm Officers mediated a domestic issue in the 900 block of Failor St.
10:57pm A report of fireworks in the 900 block of N. Sandusky Ave. was investigated. 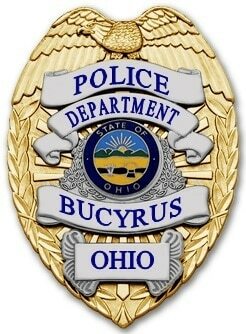 11:56pm A resident at Bucyrus Estates reported being threatened by someone she knows. The incident is under investigation. 12:35am Officers mediated a domestic issue in the 600 block of E. Warren St.
1:16am Officers mediated a domestic issue at the Holiday Inn Express. 1:23am A false alarm in the 1100 block of Isaac-Beal Rd. was investigated. 1:54am A report of a suspicious male in the 300 block of N. Sandusky Ave. was investigated. 2:42am Officers checked multiple locations for flooding throughout the city. 5:06am A written traffic warning was given in the area of E. Mansfield St. and Iron St.